PAN Tribal Asset Management | PAN-Tribal Global Equity Fund takes the award! 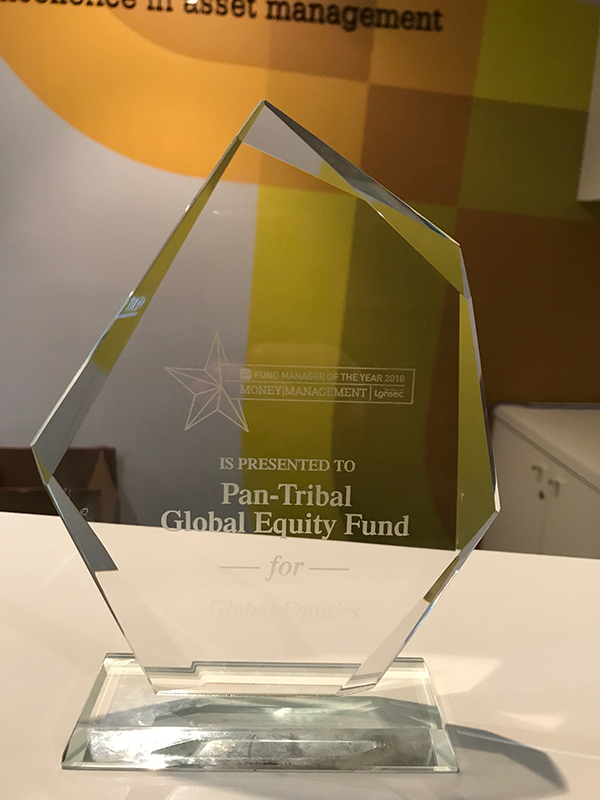 PAN-Tribal Global Equity Fund takes the award! We’re delighted to announce the PAN-Tribal Global Equity Fund is the winner of the Money Management/Lonsec Fund Manager of the Year Award – Global Equity (Large Cap) – 2018. As an initial screen, fund managers need to be rated ‘recommended’ or higher by Lonsec in their category. From this universe, Lonsec used two equally weighted components to select the finalists and winners in each category. The first component is the one-year excess return for representative funds for calendar year 2017, based on wholesale products. The highest scoring fund manager, from the aggregate of these two equally weighted components, will be declared the winner in each category. The second component is a qualitative analyst ‘momentum’ score, determined by the Lonsec research team for managers in each category. It includes factors such as process enhancements, team stability and depth and risk management. “We undertook significant due diligence before appointing Davis Advisors to manage the PAN-Tribal Global Equity Fund; that Lonsec’s due diligence has twice shortlisted the fund for this award supports our belief in the Davis Discipline,” said PAN-Tribal Asset Management CEO Colin Woods. To read Money Management’s overview of the award-winning PAN-Tribal Global Equity Fund, click here. Fund Manager of the Year awards do not constitute investment advice offered by FE Money Management or Lonsec and should not be used as the sole basis for making any investment decision. All rights reserved.